You have been day trading part-time and making some decent extra income. You are not day trading for a living, not yet. That is your dream. To work anywhere you want, with just an Internet connection and a computer. Are you ready to make the leap and start day trading for a living? Day trading for a living is the same as becoming an entrepreneur and starting your own business. It is a huge commitment and a major step in life. 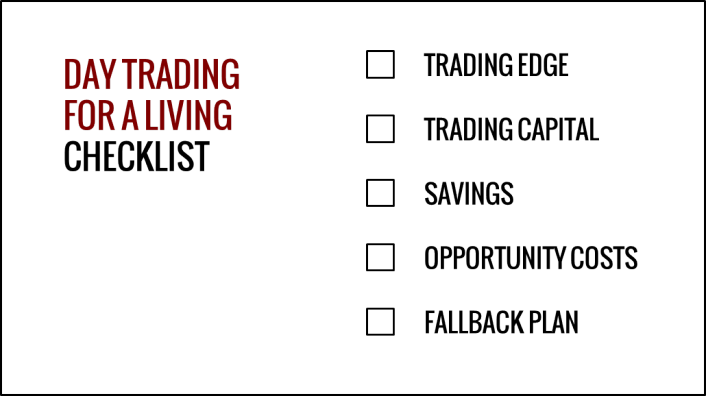 This 5-item checklist will help you decide if you are ready to day trade for a living. 1. Do you have a trading edge? You have made some money from day trading part-time. Or you have made a killing from day trading simulation. But do you really have a trading edge? Based on your trading performance up to now, you are a profitable day trader. Count the number of trading days you traded. Include days that you looked out for trading setups but was unable to find any. On those days, you did not take any trades, but you traded the session. Not taking bad trades contribute to your trading edge, so we count those days in. You should have traded around 60 trading sessions. The more, the better. At least 30 trades. The more, the better. This is the most important factor. You might have made a fortune over a year of day trading with hundreds of trades under your pocket. But you might just be lucky. 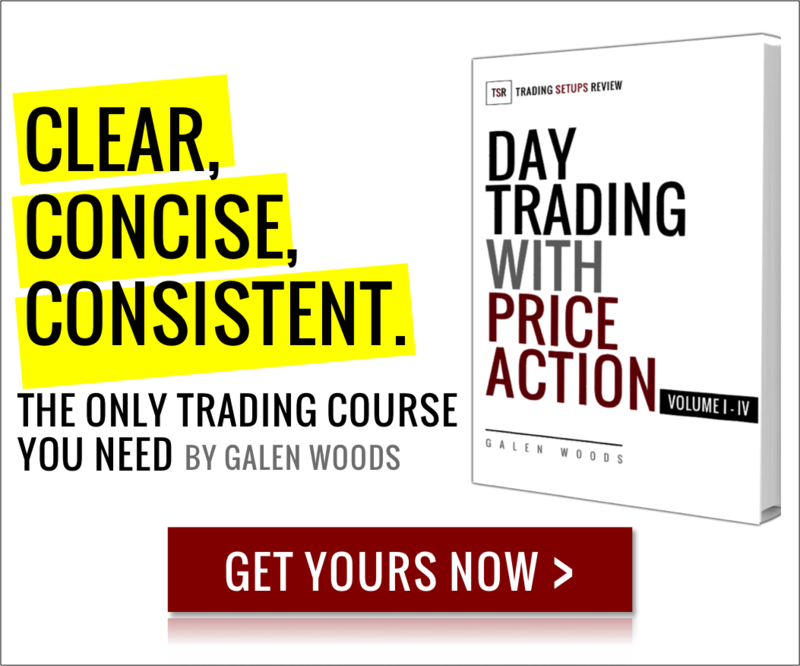 Your track record’s quality depends on the consistency of your trades with your trading plan. If you have planned the trade, and traded the plan, you are good to go. 2. Do you have enough capital? To answer this question, work out the following numbers first. If you have kept track of your personal finances, you should know the answer. If not, it’s time to start keeping tabs on your expenses. A day trader must master his or her personal finances. This is because we don’t draw fixed salaries. Our income is volatile. Budgeting and cash flow planning is essential so that we can use our volatile income to meet relatively fixed expenses. Holly Johnson wrote a great article on budgeting on a variable income, which is very relevant to day traders. Based on your trading performance, calculate the size you need to trade to meet your income goal. Using your money management model, work out how much trading capital you need. For instance, you need a monthly income of $1,000. You need to trade 3 futures contracts to make that amount, on average. For each contract, your average risk per trade is $250. For 3 contracts, that will be $750. According to the simple money management model of risking no more than 2% of your trading capital, you will need $37,500 as your trading capital. If you have been day trading real money part-time and are conservative, use 150% of the required capital you calculated. If you have been day trading fake money, use 200% of the calculated capital. You will realize that trading real money is very different, and a lot harder. Before you start day trading, you should pay off all your debts. So we are referring to net savings. After paying off all your debts, your savings should cater for a year of living expenses. Having enough savings for your living expenses is critical to your day trading performance. If you feel the pressure to make a certain amount of money each month, you will feel tempted to take more trades than you should. You will start to see trading setups where there are none. Having immediate financial stress will definitely affect your day trading performance. 4. Are you ready to give up your current job? For some people, a job is more than just a job. It forms an important part of their social life and gives them opportunities for self-actualization. A day trading career has limited opportunities for socializing and recognition from your colleagues (not that you have any). Day trading for a living gives you freedom, and isolation. 5. Do you have a fallback plan? You must plan for failure. Have a stop-loss. Just like what you have for every trade. To start day trading for a living is a courageous step. I applaud you for taking a step towards your dream. But not everyone is cut out for day trading. You may deplete your trading capital and you cannot continue trading. But you still need to pay the bills. Do you have a contingency plan? Are you able to find a job easily? Can you work as a freelancer for some income? If you cannot pass the first two checks, don’t even think about day trading for a living. Item 3 helps you to maximize your chance of trading for a living successfully. Item 4 wants you to reconsider. Item 5 seeks to control damage. As traders, risk is part of the game. We need to deal with the risk of us not trading well. If you pass all 5 checks, you are ready to starting day trading for a living, if that is really what you want.